Why go out to enjoy air hockey? 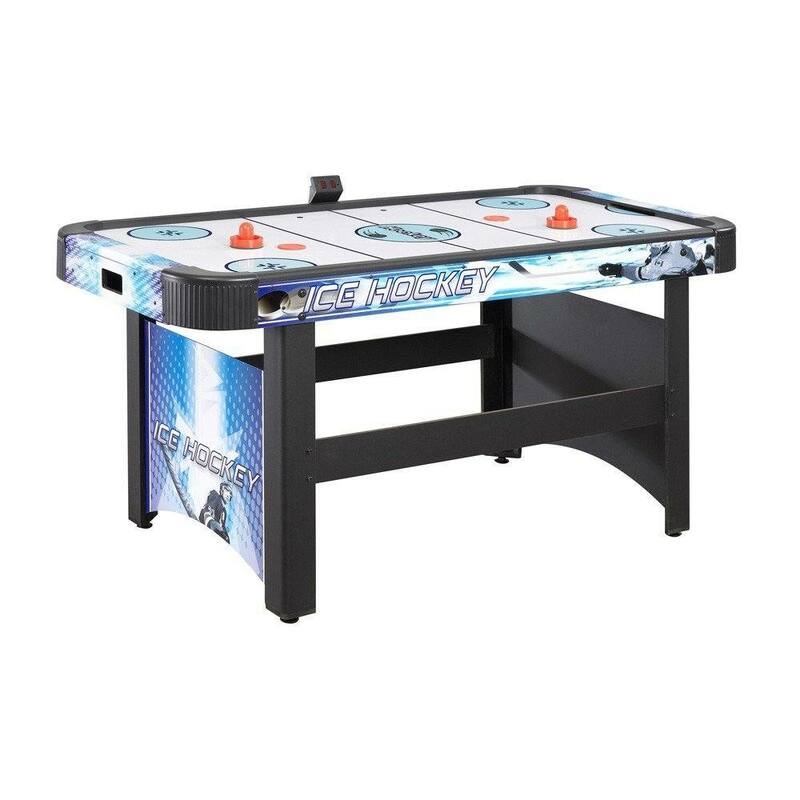 The best home air hockey tables model are affordable, and they’re lots of fun to play. 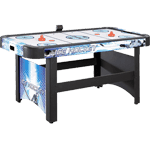 Lots of commercial spaces like to feature best air hockey tables﻿﻿﻿﻿﻿﻿﻿﻿. They’re fun for the customers of pubs and fast food joints, and people are encouraged t o stay a while and spend more money. 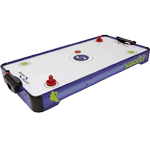 But you can get that fun while staying in with the best home air hockey table you can get. It saves you quite a bit of money and it encourages bonding among family and friends. Let’s start of the list for a table that’s extremely affordable. To cut the price down, the dimensions are best suited for younger players at 40 by 20 inches. The price is so low that you’re not risking much if your kid ends up getting tired of playing after just a few days. But it’s pretty well-known that air hockey is quite addictive for people of all ages. It helps that the gameplay is reliably exciting, thanks to the air motor that provides the air cushion for the puck. It also comes with manual scorers so that your kids don’t fight about what the score is.It’s also quite nice to look at. It makes kids excited to play, and you don’t mind its look in the house (and especially in the game room or the kid’s bedroom. The dimensions allow you to bring it with you for fun at picnics and children’s parties, and it’s also easy to store away at home when the family is done playing. It doesn’t have any legs, so you’ll need a table to set it on although for some kids the floor will do just fine. In the park, the picnic tables will work very well. 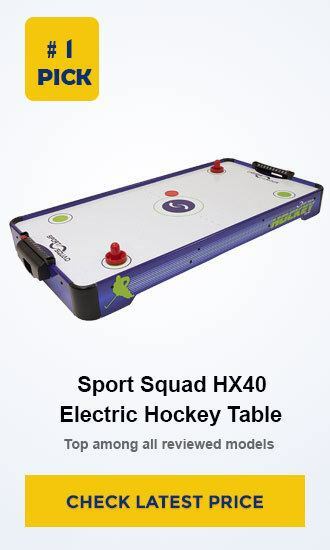 It won’t slide all over the table as the Sport Squad HX40 has rubber pads at the bottom. These pads also won’t scratch or even mark your own tables or floors at home. Cheap doesn’t really mean low quality here, as the wood the table is made from is quite strong. So this can last for quite a while, and that makes its price a very good bargain indeed. 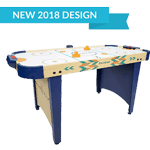 Harvil makes several versions of the air hockey table, and the 5 is one of their bigger models. This makes it fun for kids of all ages, and adults will (and should) probably join and the fun as well. It measures 60 by 28 inches, and it is 33 inches high. What will really make this a lot of fun to play is that the air from the motor is quite powerful. That’s because there are 2 blowers working together to provide the air cushion. 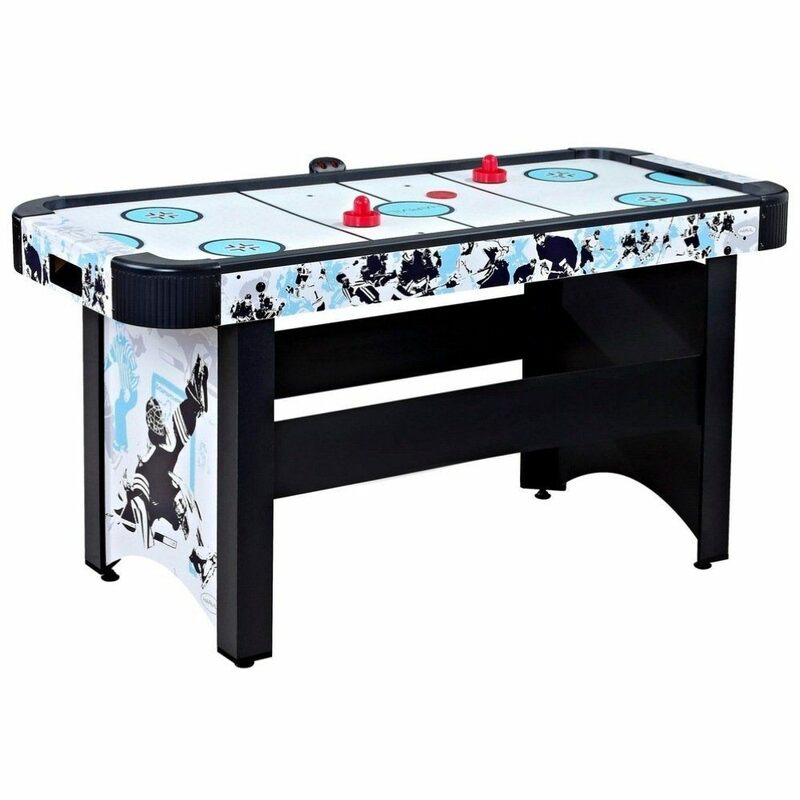 And it also looks festive and fun, with lots of ice hockey graphics along the sides and between the legs of the table. The legs are very sturdy, and with the 48-pound weight of the wood used for the construction it should stay in place even during vigorous gameplay. The legs are adjustable using the levelers, so it should be easy to keep the playing surface even and flat.It’s easy to assemble, and it probably won’t take you more than half an hour to finish. You’ll need to attach the electronic scoring unit, and this one uses batteries (while the blowers are plugged in). It will last a while too. 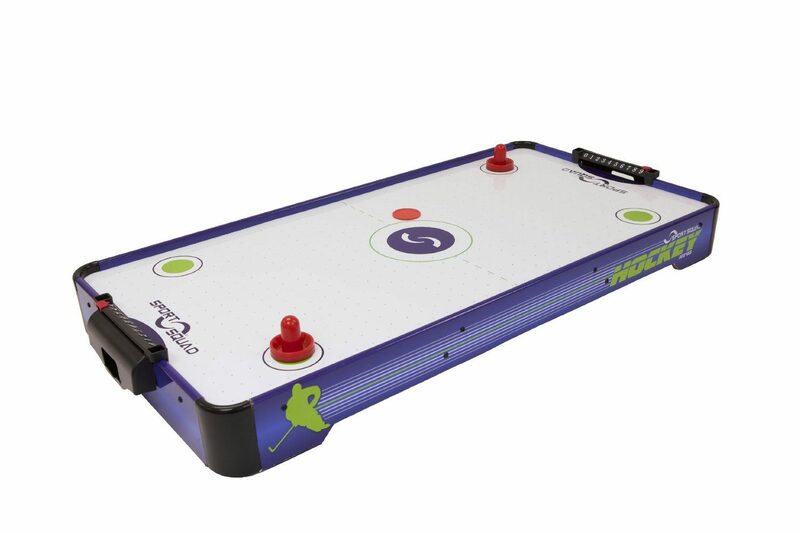 This is a smaller air hockey model from Harvil and there’s only one motor. That makes it a true bargain with the price even though the size and the air from the motor are quite sufficient. It build is very sturdy, and you can even sit on it and not worry about any damage. That’s because it’s made of MDF (medium-density fiberboard) that’s been certified by the CARB, so you don’t need to think about formaldehyde emissions from composite wood products. Also, the legs of the table are L-shaped and thick while it weighs 40 pounds. To keep it even and prevent wobbling, the legs also come with levelers. It’s safe for all your floors. The size is good enough for the whole family, and even adults will appreciate the 47 by 26 inches for the playing surface. You don’t really need a lot of room for it, as the entire thing measures only 54 inches long. The dimensions also help reduce the time you need to assemble everything, and it should take more than 3o minutes.It looks good, as the design seems festive without looking overly decorated. All in all this is fun for the whole family, with younger kids and teens probably enjoying their time away from their smartphones. And when the kids are away, daddy and his friends will enjoy playing this too. If you prefer something a bit bigger (but not too big that you have to shell out a thousand dollars), then this can work for you. It measures a full 60 inches long and 26 inches wide, and it’s 31 inches high. This offers a lot of playing surface for even more exciting games. What keeps the game moving is the high-output blower, which you need to plug in. It also comes with an automated scoring system that’s powered by a pair of batteries. It’s quite helpful in preventing arguments as to what the score actually is. Sometimes it can be frustrating to play this game with other tables, as the gameplay can be interrupted by annoying aspects. It’s annoying when you get this with some damaged parts due to the delivery, but this comes with Dual Protection Packaging. 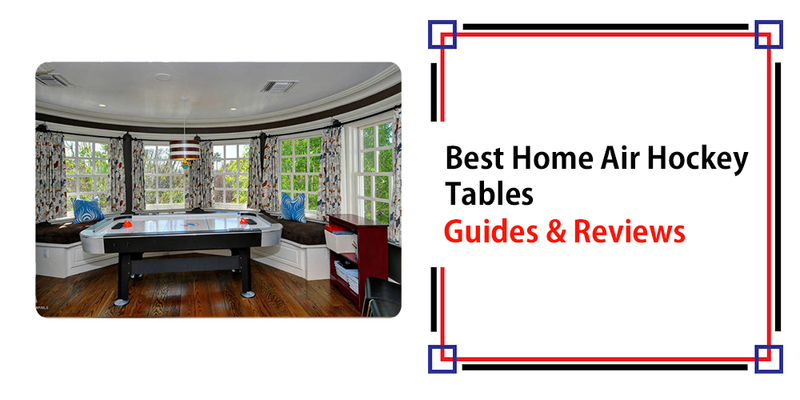 Other tables may wobble, but here you have levelers for each leg to keep the playing surface flat. For stability, the legs are also L-shaped and reinforced. The goal boxes won’t halt play for long when someone scores, as it has an automatic puck return feature. It’s fun to play, and the nice graphics can get the kids excited to play. And it’ll certainly last, as the CARB-certified MDF used for the construction is extra thick at ⅛ of an inch. This is fun for the whole family, and the bigger size will make even the adults excited to play. It’s certainly good for father and child bonding moments, as long as the taunts aren’t excessive! Not this is the biggest of the air hockey tables on this list. 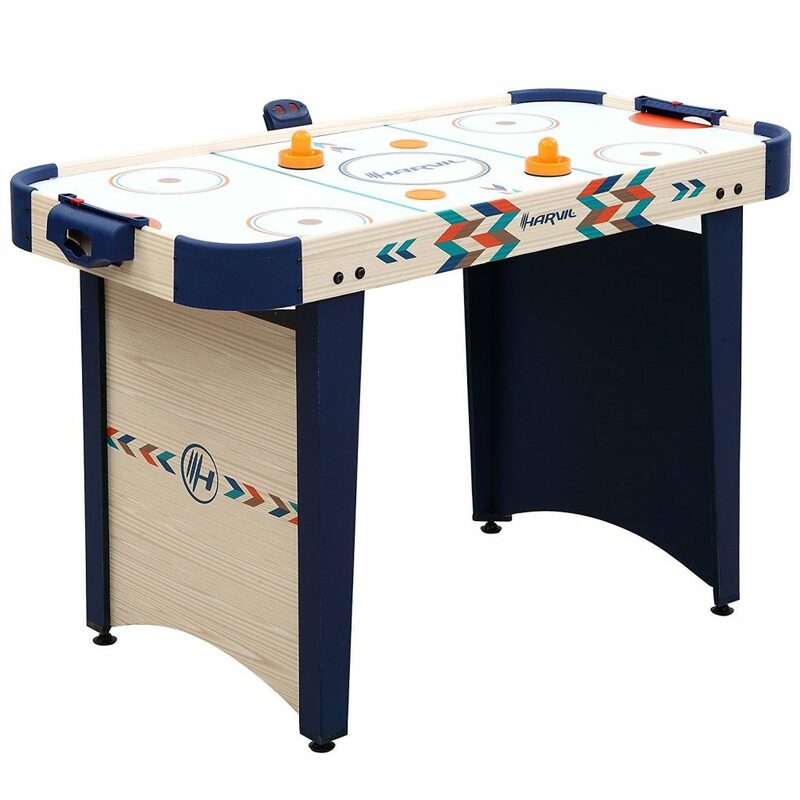 It may not be in the “standard size, but at 65 inches long and 32 inches wide for the playing surface, you’ve got lots of space to play with. But it’s still compact enough for most homes, since it is just 66 inches long overall. Setting it up is rather easy, even if the instructions aren’t exactly crystal clear. You don’t really need special tools or even special DIY knowledge to assemble this without instructions. It weighs 50 pounds, so the weight adds some stability while it’s still not a problem to carry it around to the spot where you want to place it. The game play is very smooth, as the playing surface air blower offers enough air, the automated scoring system works fine and there’s a manual scorer too. The puck and the pushers are in the right size to that you can’t just cover the goal with the pusher. The fan isn’t all that noisy, so it’s perfect for the living room.At this price point and size, this can still be considered a started model, as bigger tables cost up to 5 times more. At this price it’s a true bargain. Even 6-year old kids can play with this, because the height of the table is only 32 inches. Besides, the kids will really love how cool it looks. As for parents, they’ll like that it’s not all that expensive and yet it’s very durable. The MDF used here is half an inch thick! You can slap the puck as hard as you can and you won’t have to worry about damaging the side walls. All in all, it’s fun for the whole family. 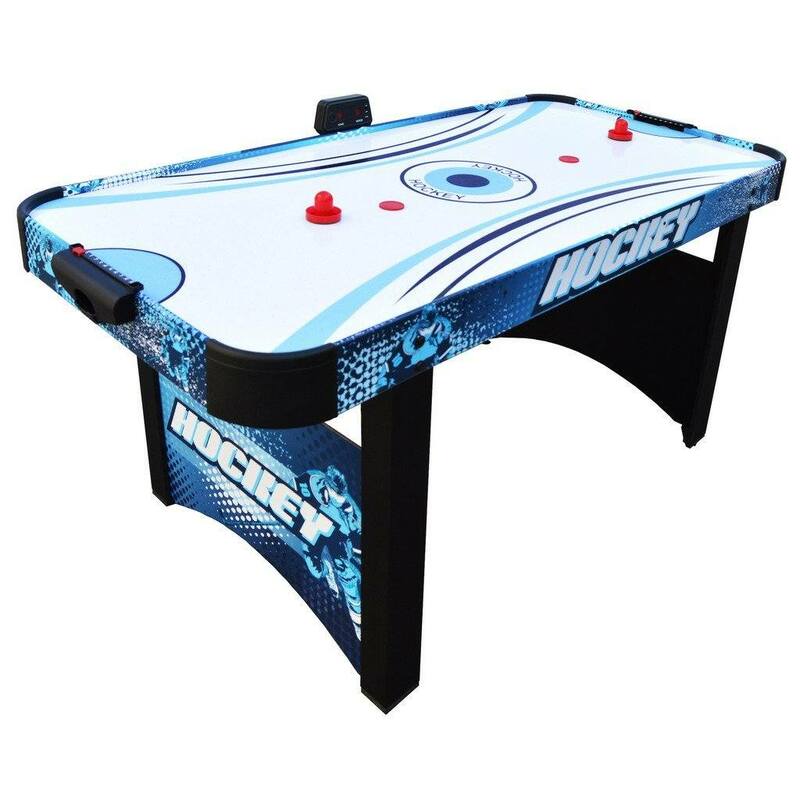 Here, it’s very obvious that you have two ways to go about buying the best home air hockey table for your family. You can just buy one for the kids for very little money, and the compact size makes it portable and ideal for small apartments. Or you can get one a bit bigger for only a small fraction of the size of the standard ones. These models are big enough for adults, and it can really help bond families together. There’s no need to go out to enjoy the game. 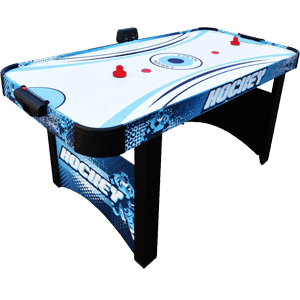 If you have a game room, the bigger air hockey table is a good choice and a good bargain.